A podcast is an audio file that can be downloaded and listened to by anybody. In 2004, Dave Winer made it possible for audio files to be syndicated, so that people could subscribe to shows they liked, and have them automatically downloaded to their computer or device whenever a new episode was uploaded, and podcasting was born. Some people like to think of podcasts as radio shows that can be downloaded from the Internet. Since the technology was made available, people have created podcasts on every topic imaginable. Today, you can use sites such as Spreaker, iTunes, or PodcastOne to find and subscribe to podcasts on topics as diverse as business, comedy, self-help, or parenting. Any type of business can benefit from hosting their own podcast. It gives you a unique way of sharing your opinion, highlighting your industry knowledge, or creating inspiring content by interviewing thought leaders in your industry. The powerful thing about podcasts is that once a customer finds one that interests them and subscribes to it, all future episodes will automatically download for their listening pleasure. They can listen to it during their commute, at the gym, or even at their desks. Plus, listening to a podcast is a very connected experience, and it can establish a strong connection between you and your listeners. 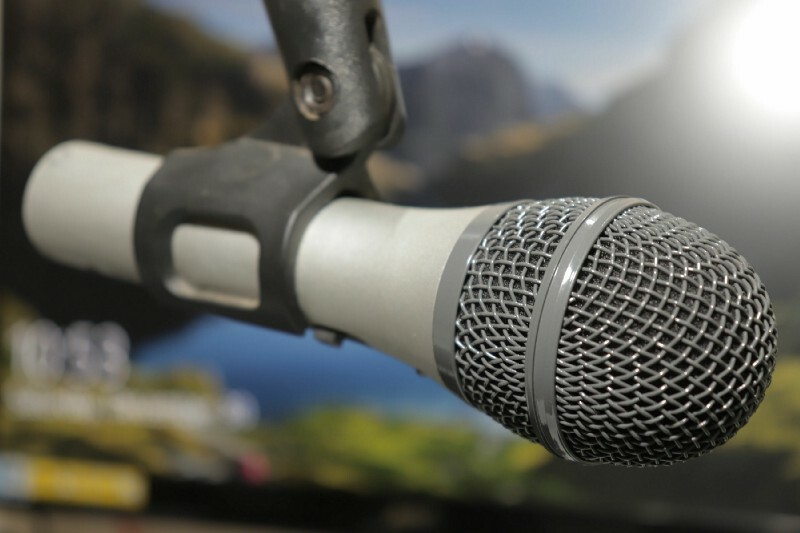 Podcasting is a powerful inbound marketing technique. In this post, you will learn about the best audio equipment, audio editing software and towards the end, I’ll share a free online platform to host your show. Here is the complete guide to creating your first podcast! The most important piece of equipment that you need to begin recording podcasts is a good microphone. Why you need a great microphone? When it comes to podcasting, the most important thing is audio quality. The biggest mistake new podcasters make is forgetting this fact. Big mistake. It’s so simple to create great quality audio that audiences will not tolerate bad audio quality podcasts. This is unfortunate, because even though you might have something valuable to say, people won’t take you seriously if you don’t take yourself seriously first, and invest in some good hardware. But, don’t be fooled, costlier mics don’t mean better sound quality. Believe me, I know! How to choose a great microphone? The first thing to remember is that most microphones are built for a very specific purpose. It’s important to understand these differences before buying a microphone. There are two major types, condenser mics, and dynamic mics. The condenser mic is super sensitive and picks up even the oddest of noises like the echoes in your room. These are the mics you see in a professional audio recording studio. The dynamic mic, however, is more robust and picks up voices only near the mic. Dynamic mics are the ones you see the singers use at a concert. I always suggest the dynamic mics because most of us don’t have sound proof environments. Another tip is to find out more about the pickup pattern. The pickup pattern will tell you from which directions the mic can pick up audio signals. My advice to you is not to go overboard and spend too much money on a microphone or other audio equipment, like limiters and compressors, until you know if you actually need them, and if you’ll be doing podcasting long term. When looking for a microphone, I highly suggest you choose a USB powered one so that you can plug it directly into your computer and start recording immediately. This allows you to use the same microphone with your desktop computer and also gives you the ability to take it with you and record on your laptop if you need that functionality. If you would like to learn more about the different kinds of microphones in the market and which one works you, I’ve written a blog post for you. The best microphone for Podcasting? There are so many mics in the market. But the best value for money mic you can get is the Audio Technica ATR 2100. Here are some of the reasons why I recommend this microphone. Every microphone requires some accessories to make it convenient to use. Here is the complete list of the required and recommended accessories for microphones. Just one thing you’ll absolutely need is a pop filter. Why you need Pop Filters? These noises are inconvenient and can be disastrous in studio recordings, so how do we go about avoiding them? Use a pop filter ofcourse. A pop filter or pop shield is a noise protection filter for microphones. It serves to reduce or eliminate popping sounds caused by the mechanical impact of fast-moving air on the microphone during recorded speech and singing. Additionally, a pop filter can protect against the accumulation of saliva on the microphone element. Salts in human saliva are corrosive; therefore, use of a pop filter may improve the lifespan of the microphone. 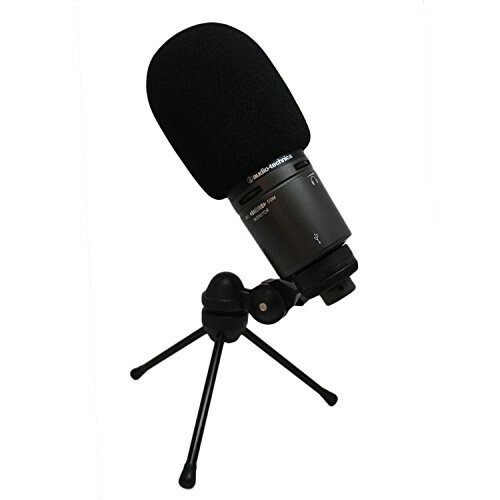 A pop filter reduces the plosives and gives you cleaner audio to work with. 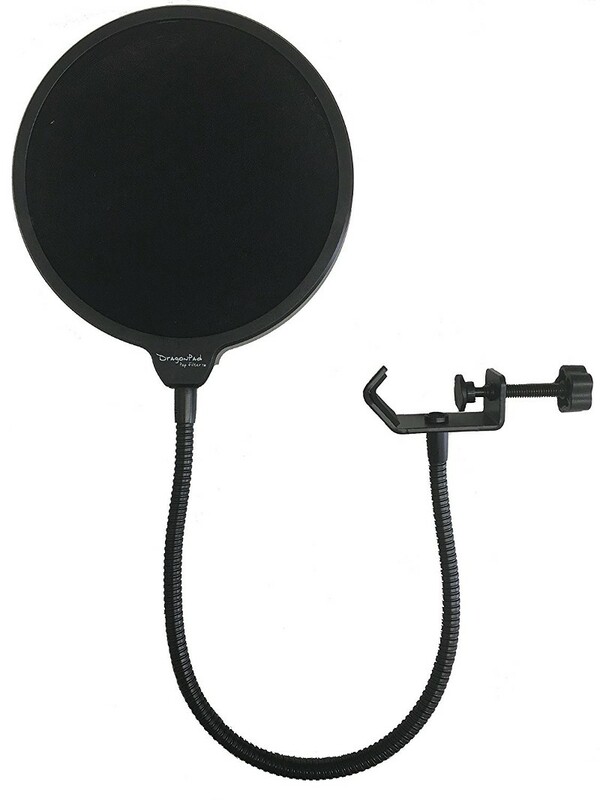 There are two types of pop filters, one is a foam pop filter and the other is a nylon windscreen pop filter. Both do a great job, but I have found the foam pop filter to be more practical for everyday use. Here is a video where I speak about what I think of the two pop filters. Nevertheless, the difference is so small that you will actually need to be an expert to discover it in the first place, so it shouldn’t really affect your decision. 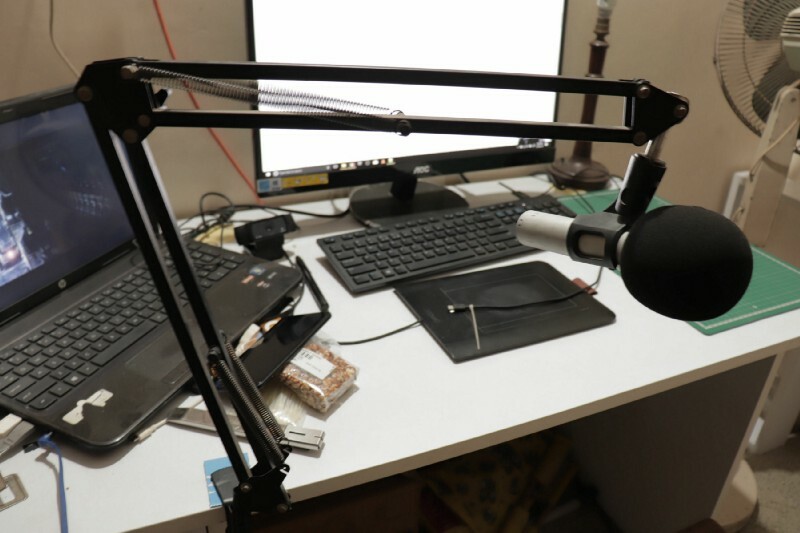 The Audio Technica ATR 2100 and some other mics mostly come with a foldable table stand. While they work, for the most part, I would suggest you get yourself a scissors hand boom mic stand with a shock absorber. There are 2 main advantages of having your mic mounted on these stands. When you mount your mic on a table stand, noises from your table, hand/ mouse movement, and keyboard typing travel through the stand and into your recording. You don’t want that. Having your mic mounted on a boom stand reduces this problem to a great amount and if you choose to add a shock absorber, it will remove the problem entirely. 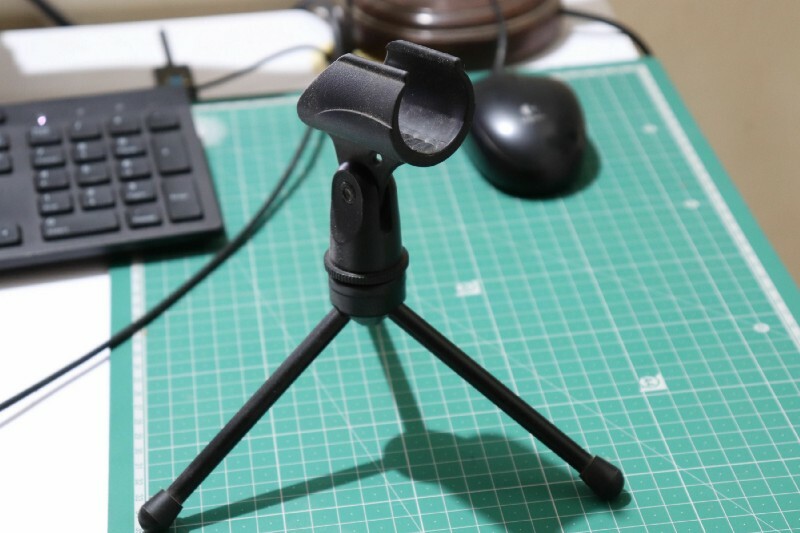 This stand also allows you to move your mic freely around your workspace without getting in the way of your other devices. Really great advantage if you should ask me. I have a very small computer table and having my mic off the table is really a big deal for me. You can get the Neweer Mic Stand which I think does a good job. Audacity, enough said, next topic! Audacity is FREE, OPEN SOURCE and does a fantastic job of recording, editing (even mp3 metadata) and is the go-to software for millions of podcasters. Once you’re done producing your podcast, you will need someplace to host it. While your first thought would be to host it on your own server or website, that might not be a great idea. While you can publish your podcast on your website, it’s always best to keep your podcast stream separate, because traffic for your podcast can affect your website’s performance or vice versa. 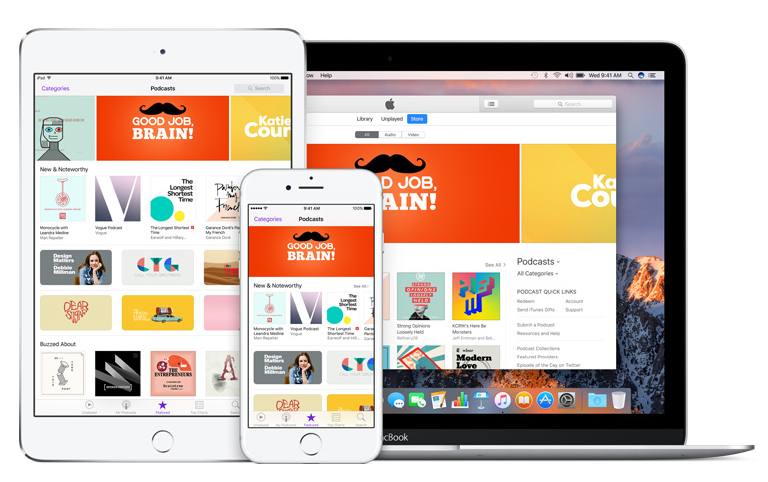 Hosting with a dedicated podcast hosting service will provide you with an RSS link which you can later share with iTunes, Sticher etc (popular podcast search engines) so that people can find your content. There are many paid services out there that do a great job. But I suggest a free service that does an even better job. Podcasts.com is a surprising entity on the internet that provides free hosting with unlimited bandwidth and storage. Too good to be true? Check out how they can provide free hosting on their FAQ page.